Asthma is primarily an inflammatory disease of the respiratory system, but being a complex medical condition, it can affect other organs and organ systems in certain ways. Bronchial asthma is primarily an inflammatory disease of the respiratory system. Although the exact cause of asthma is still unknown, today we know that there are genetic and environmental risk factors which can trigger disturbances in the immune system, which contribute to the biochemical reactions which finally cause asthma symptoms. Knowing that, it is not hard to assume that persons with asthma, can often have problems with other organs and bodily functions since the immune system is responsible for proper functioning of the whole body. Furthermore, breathing difficulties and continuous forced exhalation and inhalation can interfere with normal functioning of other internal organs. 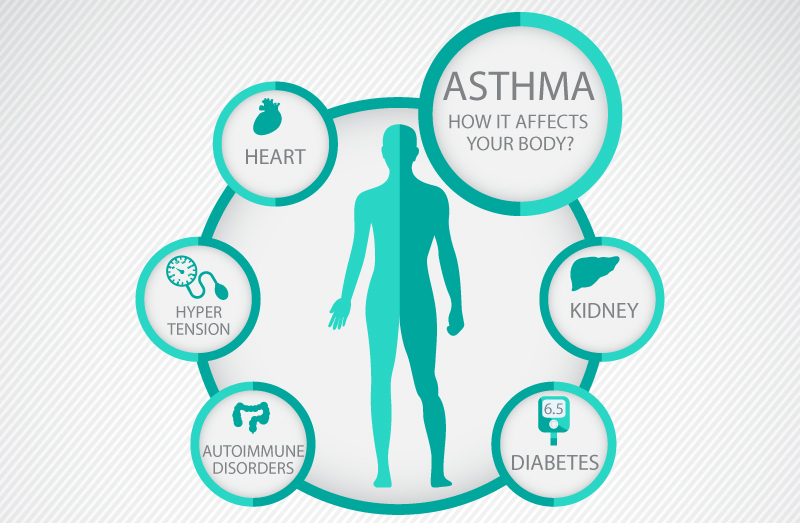 Take a look at the 5 ways in which asthma can affect your body, other than causing breathing difficulties. Is asthma related to some autoimmune disorders? an autoimmune disease affecting the mucosa of the intestines. These findings are by no means something that asthma patients who receive proper treatment should be worried about. In fact, scientists always point out that it is hard to find the real causal relationship between asthma and these autoimmune diseases. This is because most autoimmune diseases appear due to a combination of genetic and environmental factors and have two-way relationships between them. In other words, it is hard to determine whether asthma induces other autoimmune disorders or the other way around. How asthma affects the heart? Both asthma and coronary heart disease (CHD) are very common in general population, so we cannot jump into conclusion that these disorders are related if a person has both of them. However, researchers were curious enough to conduct studies and perform statistical analysis. In one of these studies, it turned out that patients with asthma have a 32 percent higher risk of CHD than healthy individuals. What is interesting about this relationship is that asthma and CHD have a stronger relationship in women than in men. The reason for that is unknown, but one of the suggested hypotheses is that estrogen stimulates chronic inflammatory processes, which occur both in asthma and CHD. The authors of this study state that this hypothesis should not be taken for granted since these are complex disorders and many factors can have an influence on their clinical manifestation. Other scientists blame corticosteroid drugs which almost all asthma patients take. Opinions regarding this are controversial. It would be logical that corticosteroids with their anti-inflammatory properties have a positive effect on atherosclerotic plaques in the blood vessels, and many studies confirm that. However, there are studies which show completely opposite – that pathological changes in blood vessels become worse after long-term corticosteroid treatment of asthma. We will have to leave this discussion to scientists for now. Asthma and hypertension share a common pathophysiological issue. Namely, smooth muscle spasm has been found in both disorders – in smooth muscles surrounding the airways in asthma and in smooth muscles in the walls of arteries in hypertensive patients. Therefore, it is not a surprise that patients with asthma are also at a higher risk of developing essential hypertension – the most common type of hypertension of unknown origin present in more than 95 percent of persons with high blood pressure. Furthermore, acute asthma attacks are stressful events for the entire body, and increased blood pressure is a very common finding during asthma attacks. Can asthma trigger diabetes mellitus? It has been reported that asthma can act as a risk factor for the development of type 2 diabetes. One of the studies which included 42,842 participants, concluded that the risk of type 2 diabetes in patients with asthma was increased by 31 percent compared to healthy persons. This story goes both ways – according to findings of other studies, persons with diabetes also have an increased risk of developing some of the respiratory system disorders, such as chronic obstructive pulmonary disease (COPD) and asthma. None of the above stated relationships between asthma and other diseases should frighten asthma patients. Many of those are still in the phase of an active investigation. These should only stimulate asthma patients to stick to their prescribed therapy and check their health status regularly in order to minimize the chances of asthma to affect other organs and metabolic processes in the human body.